After last years 'King of the point' held in 3-4 metre surf it was a tall order to call this years event on! With a waiting period from 1st October 2018 to the 1st May 2019, the event was given the green light as a large deep low pressure system situated itself high in the North Sea. Millibar readings were 959 and a quick scan of wave buoys 24 hours before showed surf pushing 20 feet way up North heading our way. The criteria was met and all competitors called to arms!! Millibar readings were 959 and a quick scan of wave buoys 24 hours before showed surf pushing 20 feet way up North heading our way." Round one competitors completed the arduous paddle out through a pretty much closed out channel. Notable performers were Saltburn local Evan Rogers (last years 2nd place finisher) polishing off a well thought out heat once again. Tynemouth charger, Sandy Kerr took some bombs in the challenging conditions but couldn't quite connect through to the inside section. Rip Curl's own Joel Gray charged a number of great waves and showed poise and polish. Scarborough's Daryll Broadbent showed local knowledge by completing a near free fall take off into massive wall that unfortunately shut down on the inside. One hour heats sound like a long time on the face of things, but a nightmare paddle out wide closeout sets and inevitable drillings kept everyone on their toes indeed. Up next was heat 2 heavily laid with local Scarborough talent James Taylor, Shaun Thomas and new kid on the block Cade Dickinson. The first ever female competitor Emily Grimes showed guts and determination taking some treble overhead sets on a longboard? Up next was heat 3 heavily laid with local talent James Taylor and Shaun Thomas and new kid on the block Cade Dickinson . The first ever female competitor Emily Grimes showed guts and determination taking some treble overhead sets on a longboard ???. The surf was still pumping in as heat one at Cayton Point hit the water. A slight unforecasted onshore breeze made the challenging waves even more daunting. A close heat here as some surfers like Scarborough's Daryll 'Del boy'Broadbent and Sandy Kerr went steep and deep taking off on bombs with little regard for their own personal safety. Other surfers Alex Tatko and Gran Canarias Eric Garcia put in tight moves and snaps where others couldnt all be it on slightly less smaller waves that held shape better over Caytons boulder field. Ross Hargreaves and Chris Proctor also had their fair share of bombs rolling through the difficult lineup. With the tide pushing and conditions improving slightly heat 2 was underway myself (Scott Rogerson) Joel Gray, Gabe and James Taylor chanced the the ledgey peak out back while others Cade Dickinson and Brandon Kilbride stole some quality runners from the pack. To be fair the jacking takeoff off over the boulders draws some heavy water and timing and a bit of pot luck were the order of the day. Andrew Hogg was on a mission and went for one of the biggest waves of the day, unfortunatley he didnt make it and the pasting he got and swim down the point earned him joint wipeout of the day.! I had one good one that ran the entire length of the point and backed it up with a second score, but in reality my poor showing earlier in the day ruled me out of any chances and also Brandon Kilbride dropped in on my second wave.......haha funnily enough it got us both best tandem wave of the day award. Cheers Brandon! 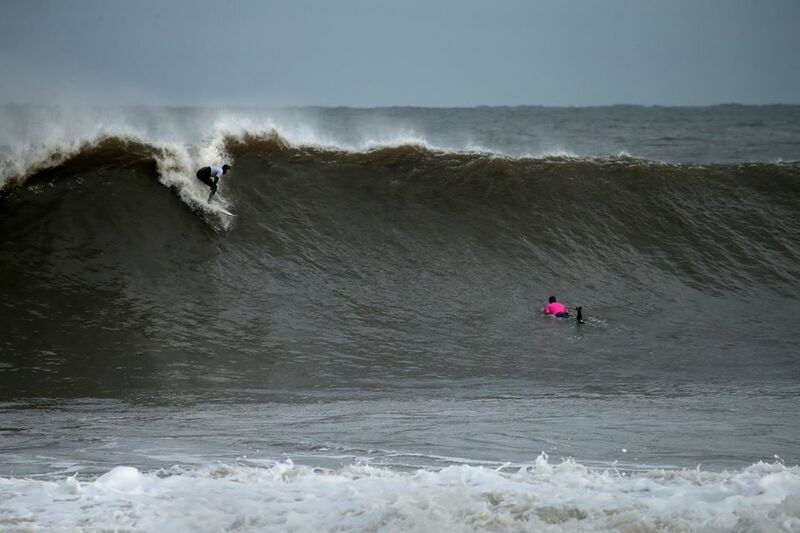 The final heat of the King of the point 2019 did not dissapoint. Kris Fairest was like a whippet out of the blocks and had some clear to see, solid waves as did Sab Pothoff linking some fine waves along the line. The last heat was full of the Scarborough crew Cade Dickinson, Tom Wilson and Shaun Thomas all trading waves and enjoying the opportunity to surf extra large Cayton Point with only six out. Emily Grimes struggled a little in the heavy conditions and later remarked that she was more scared of snapping her beloved longboard than anything else... haha respect Emily!!! Everyone scored some quality waves in the demanding conditions whilst dodging the odd heavy closeouts. The event wrapped up and all the crew headed to the Hayburn Wyke Inn for the results, prize giving and most importantly a pint and some free grub put on by Secretspot! Big thanks to all competitors and to Ripcurl and Joel Gray for helping to make the event happen and providing prizes. Already looking forward to King of the Point 2020..
All in all once again a very successful 2019 King of the point. The event was always designed to be a very fun affair bringing surf communitys together and with no knockout stages it ensures every surfer gets a full two hours in the water in solid overhead surf - Put simply the best 4 waves of the day took the King Of The Point title. Kris fairest took the title and when it came down to it, the Saltburn surfers consitency and stylish surfing at both locations earned him the crown. Gabriel Davies came in a very close second a great showing from one of the East coasts best known surfers. Son of Saltburn surfshops legend Gary Rogers, Evan Rogers consistency and wave choice came in a very close third making him the most consistent surfer over the last two King of the points. Scarborough hotelier Tom Wilson jumped back into the prizes with the longest wave of the day disapearing out of sight. Daryll Broadbent took best drop as he fell from the sky on an impossible one and in true Delboy style made it. They don't call himthe capatin for no reason. A Scarborough affair with firstly Shaun Thomas taking one of the worst beating of the day. A special mention to Emily Grimes as our first ever female competitor and longboarder who charged the big conditions and earned alot of respect.Emilies whole attitude and vibe earned her a lot of respect especially considering she has only been surfing for 3 years.